I have made a number of recent posts about Fiverr lately, but they have all been about being a Seller on Fiverr. I am also a Buyer on Fiverr, and actually highly recommend it. When I first heard of Fiverr, I used to scoff at the idea of hiring somebody there. After all, what type of quality could you really get for only $5? At the time, I was used to hiring top-notch talent that cost a pretty penny, so I was also a bit biased. But now I turn to Fiverr for a lot of work. First off, most services don’t actually cost $5. They may advertise as low as $5, but then that is just the base rate; depending on your needs you could be quoted $20 all the way up to $1,500+. Secondly, it’s amazing what you can get on Fiverr for $10-$20. I use it whenever I need help with server administration or broken code, and have used it for design work as well. In fact, I got one design done for $80 that would have easily cost me $1,000+ if I had got it done elsewhere, like from my old designer. It is far too risky to order from gigs without any past reviews, especially when you could order from dozens of other gigs which could deliver the same result as well. You need to understand that there are PLENTY of horrible sellers out there who are out for a quick buck. Even though you are somewhat protected as a buyer, is it worth your time going through Fiverr arbitration, waiting a month to get your money back? And that’s only if Fiverr sides with you – they could easily side with the seller if they provided you with something that’s even remotely related to their gig description. I would also avoid any gig that has under 3-4 reviews, as it’s far too easy for them to get their friend or other account to purchase from them, falsely inflating their rating (it would quickly become too difficult and costly for them to do this past a few reviews). 3.5 Stars – Absolute garbage. Avoid. You stand a good chance of getting ripped off. This can be seen as unethical and isn’t something I do all the time, although I’m sure I’ve done it at least once: unless you’re ordering from a succesful seller (Level 2+), most sellers will be desperate for work and will do anything to get business – especially newer gigs. If you start a conversation with a seller about what you want done, sending multiple messages back and forth, you can tell them to hang on as you’re actually talking to another provider who quoted you less and tell them that you will think about it. More often than not, the seller will immediately message you back, slashing their prices by a lot or promising an immediate turnaround. An alternative to this is that you can simply delay in responding to them for a couple of messages and they will often do this on their own as they think you changed your mind. Yes, this is taking advantage of a seller’s desperation, or you could simply look at it as a business tactic. I am also a seller on Fiverr, so I can see this from the other side. The more clear and detailed you are with what you want done, the easier it is for the seller, the more accurate the quote, the better the end results, and the faster the turnaround. For example, if you want a custom WordPress theme, don’t just tell them that you want a new design that looks “up-to-date” and “bigger”. Tell them that you want a responsive design that works on computers, tablets, and smartphones, is compatible with the latest WordPress version, supports the 3 specific plugins that you use, and uses the colour palette of your logo which you send to them. Give them examples of multiple other web designs that you want your blog to emulate. Tell them you want it to be W3C compliant and to have at least a B+ grade on GTMetrix. You get the idea. When I’m looking to get something done on Fiverr, I will always find at least 3 suitable gig candidates that meet my criteria and standards and then paste in the description of what I want (see above). This does a number of things: it saves time in case my first pick is unavailable or slow to respond, it lets me find the average quote of what this should really cost, and it shows me the quality of their response. I will then choose the gig from the seller who had the best overall response – and it isn’t always the lowest quote either – I am a big sucker for those who respond quickly, write well, and act professionally. This is starting to get into the greedy category, but I stand by this tip and it’s something I do often – especially for those with less than 10 past ratings. Before I decide to hire somebody, I want to make sure they can do what I’m asking and that I’ll be happy with it. I’ll therefore ask them to show me proof that they can do it before I place the order. For example, you might need help with some Excel formulas. You could have them send you a video or screenshot with it finished before you decide to place the order. You won’t be able to do this for all gigs – for example it wouldn’t make sense to ask somebody to design you a completed logo before ordering, but you could have them send you an extremely rough sketch if they are willing. Having sellers work on spec will give you the confidence you need to place an order if you are overly cautious. If the seller “finishes” and provides you something that you’re not 100% happy with, don’t settle! As the buyer, you have all the power. Sellers don’t want to risk getting a low rating and will do a lot to avoid this. Voice your concerns – tell the seller that they are mostly done but that you aren’t 100% satisfied yet. 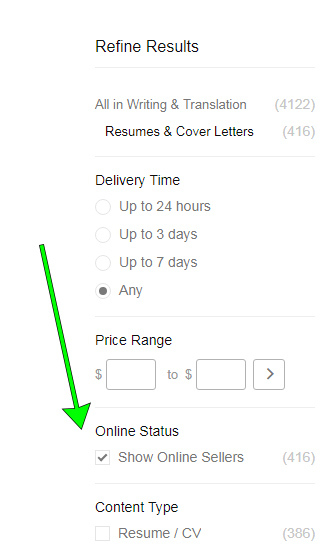 When I am shortlisting gigs to contact (see tip #5 above), I will often use the “Show Online Sellers” filter from within the Refine Results area located on the left side of the site. I do this for two main reasons. First, an “online” seller will likely respond to me within 15 minutes. Secondly, it means that they are online within an overlapping time of my own time zone, which is great to speed the process along. I don’t always do this though as it will depend on the type of gig I’m looking to hire. For example, if I’m in no rush for an order and it’s also an order that will take time to complete, I won’t use this feature. Despite what I wrote in tip #1, where I advise not to hire anyone with under 3 reviews, a great number of reviews does not necessarily mean higher quality. It just means that they are more popular. I mention this because, while it’s very safe to purchase from a gig that has 1,000+ reviews with an average of 5 stars, it doesn’t mean it will be better than a gig that has only 12 reviews and a 5 star rating. In fact, you’ll often find that the latter will not only be cheaper, but also you’ll get a much faster turnaround than hiring the more popular seller. This is because the more popular seller may have 15 other orders in the queue whereas the newer provider has only you. So really there’s a minimum threshold to concern yourself with. As long as you choose a gig with an average 4.5 star rating and at least a few past reviews, you should walk away a happy buyer. 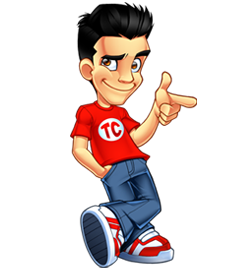 Thanks For Sharing Great Buying Tips For Fiverr Is There Any Tips To Sell Services on Fiverr? Good Job, Thanks for sharing. NYC Post, Thanks For Sharing! Thank you for the great information! Hope You’ll Keep Posting Stuff Like This. the only point, that bothered me in your blog post was “Walk on” (glad you noted this as an exception). Which kind of services do you mostly order on Fiver and do you have any shortlist of good/great sellers you might share? These tips are very useful for us. Thanks for sharing this article buddy. Nice article for startup on the fiverr like me. Cyberflix was never formally closed, yet vanished with Appleton. Cyberflix was a PC redirection alliance created in 1993 by Bill Appleton. Cyberflix was organized in Knoxville, Tennessee. They made diverse careful portraying stimulations during the 1990s, regardless left business in 1998. In Pandora, apk you can discover a ton of new music as indicated by your determination. To choose a music in pandora one mod or pandora apk mod, all you require is to enter the craftsman, kind or melody and you can likewise mess around with comparative music. This is very useful article for me. I want to work as a content writer from home but problem is that I afraid that how I identify they will paid after completion of work. As you mention about rating of seller is a way to identify someone authentic or not. I like this concept. Thank you for this information. thank you it makes sense but why should we use FIVER?? there are a lot of websites available. wow useful content really happy to say it was an interesting post. Thanks For Sheering. This Is Pradeep From Mysore To Coorg Cab . great know how to type degree symbol in word and all type of devices. Great blog! Read it twice, noticing some useful points, and even sharing it with friends. You have written an article that is very informative and useful to teachers and students alike.